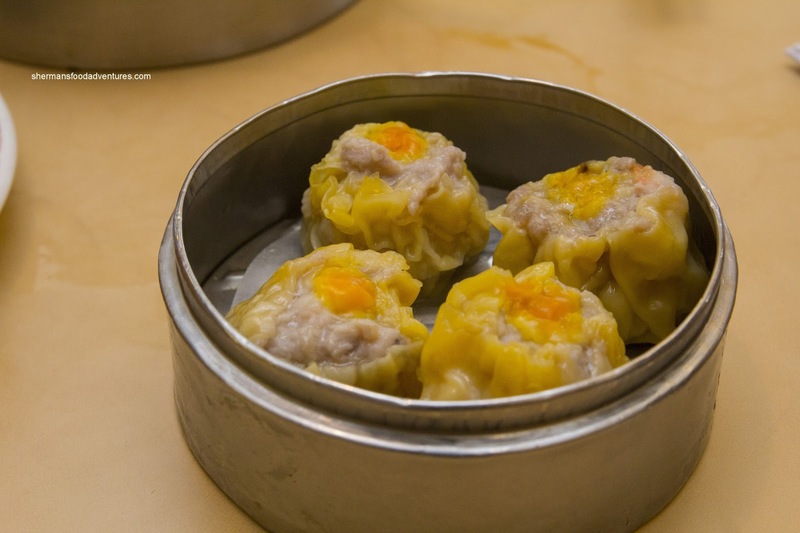 Fool me once, shame on you; fool me twice, shame on me - goes the saying... With already a mediocre Dim Sum experience in Orlando and a truly troubling one in Miami, it goes without saying that a third try in South Florida would either be the charm or the trifecta of shame. Of course expectations were not high since good Dim Sum would be a stretch in an area more famous for its Cuban food. But after heavy meal upon heavy meal aboard the Allure of the Seas, it was time to head back to the Chinese food well (even if it wasn't that great). 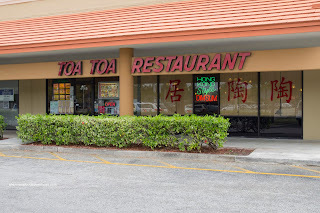 After another disappointing experience at Budget Car Rental (ironically using their "I'm Sorry" certificates), which took over an hour to get out of there, we headed to Toa Toa Chinese Restaurant in Sunrise. Walking into the place, it looked legit with a packed house of happy diners and Cantonese-speaking staff. We ordered a bunch of stuff and to our surprise, the food was actually decent. The first item to arrive was the Wonton Noodle Soup (I know, not a typical Dim Sum item, but we wanted to try it). 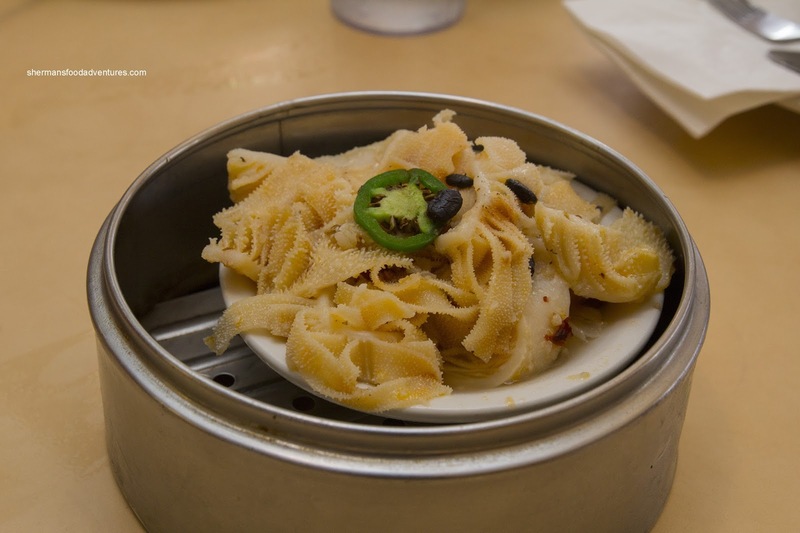 Although the noodles were hardly the chewy type, it was not mushy at least. The soup was more like mild chicken soup, but okay nonetheless. 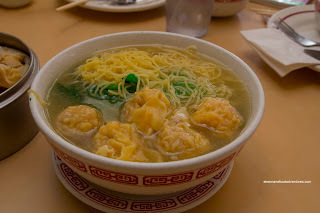 Amazingly, the wontons were good consisting of whole crunchy shrimp and tender pork. 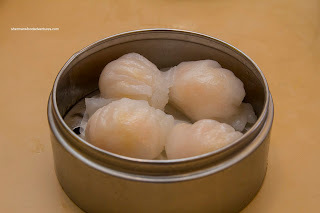 Shockingly small, the Haw Gow (Shrimp Dumplings) were passable with a shrimp filling which had a snap texture and a decent amount of seasoning which was sweet and savory. As for the Sui Mai (Pork & Shrimp Dumpling), they were passable with somewhat soft pork and whole crunchy pieces of shrimp. Moving onto the offal and such part of the meal, we had the Bible Tripe which was quite spicy. We actually enjoyed the flavor as it was quite apparent, including the saltiness of the black beans. 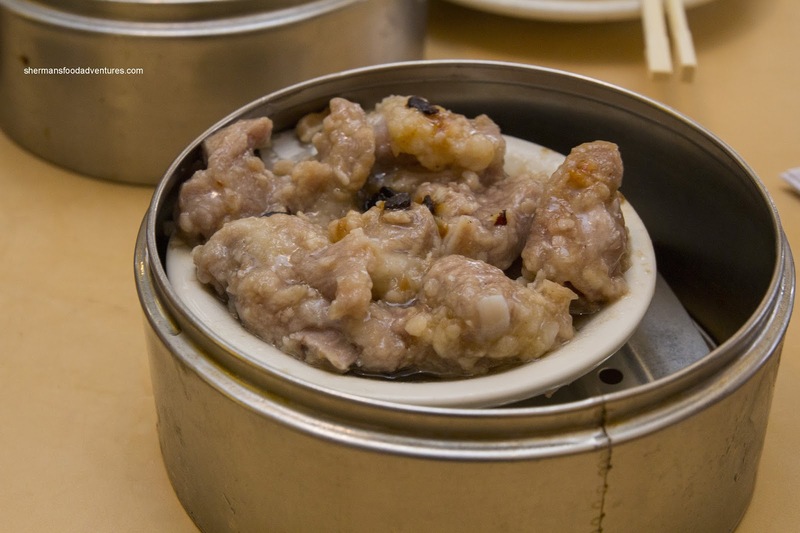 Normally, this dish can be quite bland since properly prepared tripe is typically pretty flavorless. 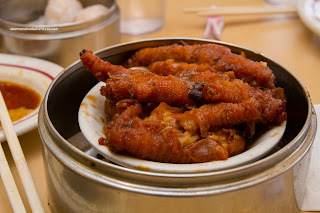 Next, we had the Phoenix Talons (aka Chicken Feet). These were plump and cooked nicely all the way through. Hence the gelatin underneath was soft while the skin was equally so with a slight resistance. Other than a few parts of broken fried skin, these were pretty textbook chicken feet. Flavorwise, there was no absence of both savory and sweet. 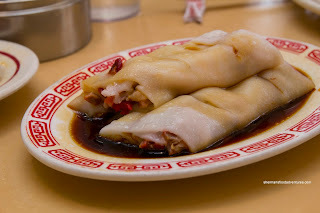 We ended up with both the Shrimp Rice Noodle Roll and BBQ Pork Rice Noodle Roll. Strangely, this was named "Paste" on the menu which didn't make much sense. Although a touch thick, the rice noodle itself was soft and moist with a slight elasticity. Not bad, not bad at all... As for the shrimp, they were prepared properly being cold-water crunchy and well-seasoned. The BBQ pork filling was both ample and lean. It had a nice meaty flavor as well. 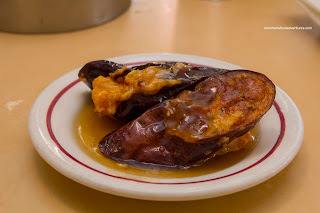 Despite the decent shrimp mousse filling (which had a bounce and was properly seasoned), the Stuffed Eggplant was very greasy and a bit mushy. It could've stood to be fried a bit less while a little more filling could've gone a long way in making this better. For the kiddies, we had to get the Lo Mei Gai (Sticky Rice in Lotus Leaves). 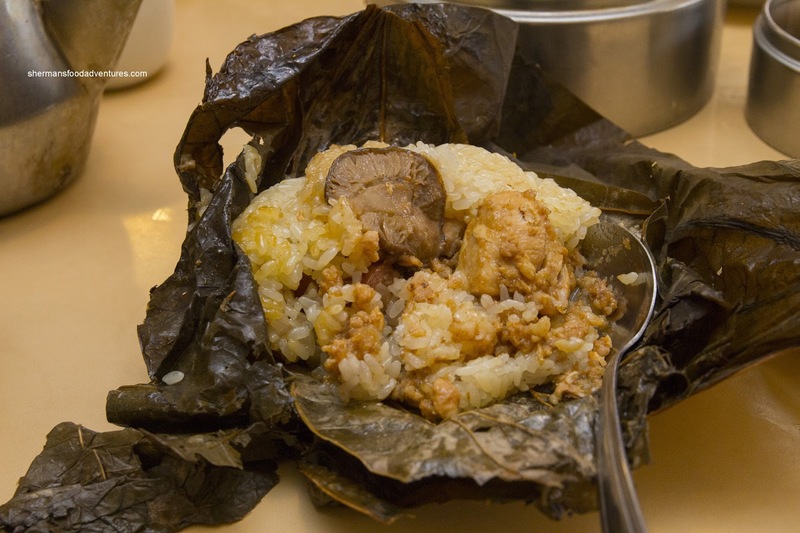 This was the traditional large version stuffed with plenty of ingredients to go with the soft sticky rice. The ground pork was a touch salty, yet tender. It went a long way in providing both seasoning and moisture for the rice. 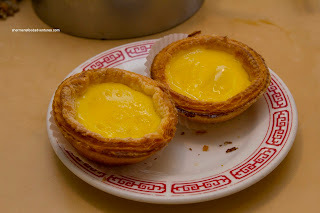 We also got the Egg Tarts, which was another kid favorite. Only consisting of 2 tarts, they were a touch over-baked which was exemplified by the dark tart shell. However, it was flaky and crisp that yielded to a semi-sweet silky egg custard. 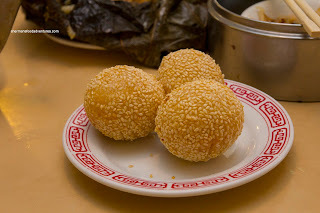 Although the Fried Glutinous Sesame Balls were a bit dense, they were crunchy and filled with sweet lotus paste. Next, we had the Steamed Black Bean Spareribs. These were legit with lots of garlic and black bean hits of flavor. As for the spareribs themselves, there was a mix of meaty rib pieces and cartilage. Fortunately, the fatty parts were kept to a minimum. In terms of texture, they were marinated just enough so they were tender while maintaining some meatiness. Arriving in a bowl swimming in diluted and thickened oyster sauce, the Bean Curd Skin Rolls were okay. 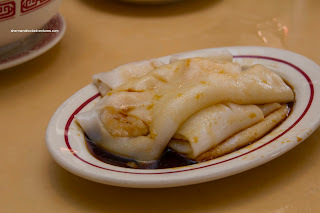 The bean curd skin itself could've been more uniformly fried, but it was still a good mix of chewy and soft. The soft ground pork filling had a particularly bamboo-shoot slant, which I personally didn't mind. 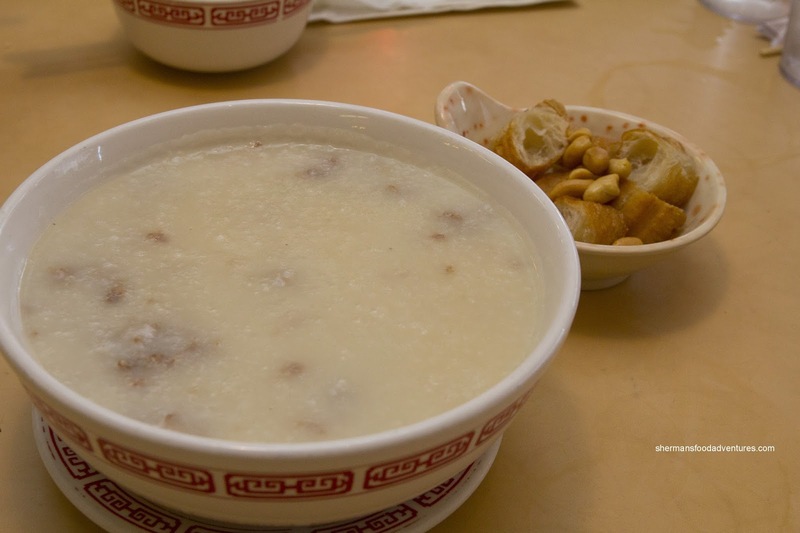 Lastly, we added 2 more items including the Minced Beef Congee. Although the broth itself was quite salty from the MSG, it did taste good. Curse you tasty MSG! 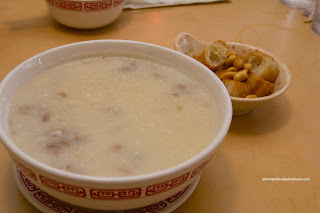 It was nicely thick from the first spoonful to the last with tender chunks of ground beef (which was a bit sparse). 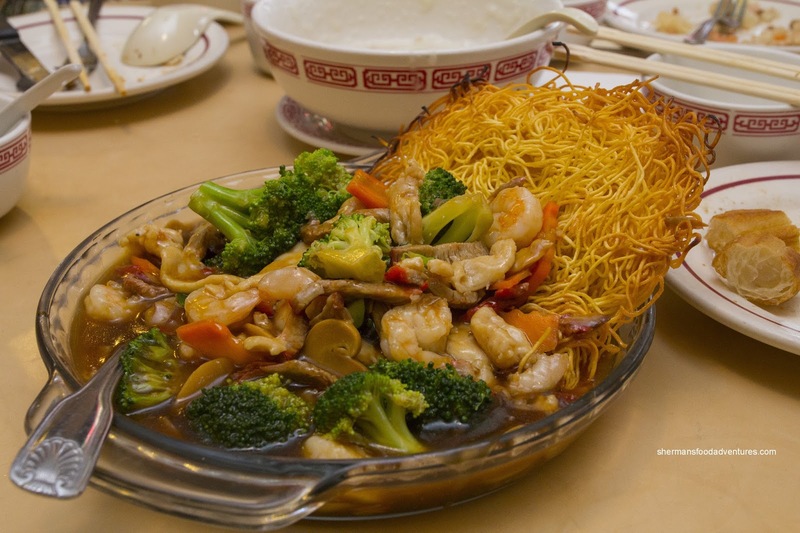 We ended the meal with the Special Chow Mein to make sure we got full. As clearly exemplified in the picture, there was much more sauce and ingredients than fried noodle. Hence, the dish was a bit too wet when mixed together. On the other hand, it did taste balanced and the ingredients were well-prepared. And really, most of the food was not bad considering where we were. 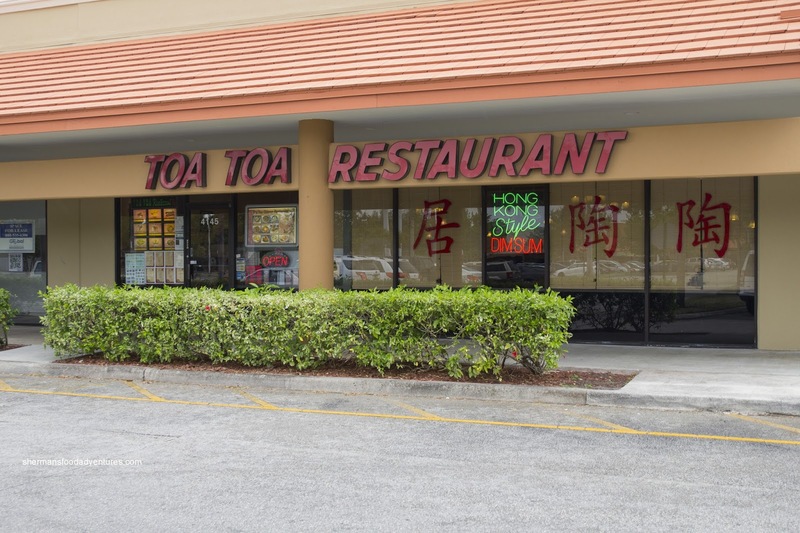 Definitely passable and an option if one was looking for Chinese food in South Florida. 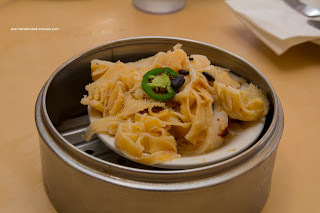 one of my favorite dim sum places!